More than 400 CFS: Expert kayakers can run the North Fork at 400 cfs and above. More than 700 CFS: Large rafts should not run below 700 cfs. It is recommended that all boats be self-bailing. The headwaters of this high elevation river in Tahoe National Forest drain from the Yuba Pass and its surrounding peaks. Running free from New Bullards Bar Reservoir, the Yuba River doubles in volume at the confluence of the Downie River. 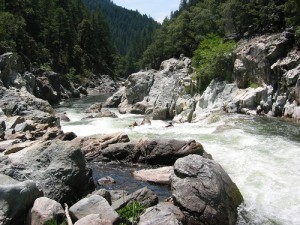 The Yuba River is a major tributary to the Feather River which eventually joins the Sacramento River and provides agricultural irrigation water to a large portion of the Central California Valley. It is said that the Yuba River got its name from the wild grapes Spanish explorers encountered growing densely along the river bank. “Uva” being the Spanish word for grape transformed into its current state “Yuba” in the early 1900s.